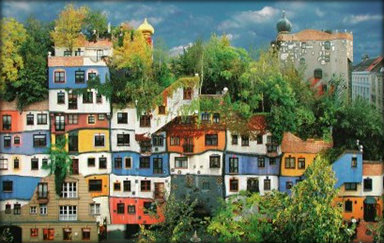 Here are some facts about Friedensreich Hundertwasser, the Austrian artist. Hundertwasser was born on 15th December 1928 in Vienna, Austria. His real name is Friedrich Stowasser. After World War 2, Hundertwasser studied for three months at the Academy of Fine Arts in Vienna. He left to go travelling. The first exhibition of his work was held in Vienna in 1952. He also became interested in architecture and he has designed many houses using irregular forms and bold use of colour. Hundertwasser had very strong political views, shaped by his experiences of the Nazi regime during World War 2. He was anti-totalitarian and campaigned against the European Union because he thought it would eradicate regional variation. He was also very aware of environmental issues. 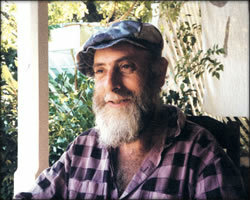 Towards the end of his life, Hundertwasser settled in New Zealand, and he was buried there after his death at sea on the ship Queen Elizabeth 2 in 2000. He was 71. Wow! This helped for me homework. Thanks for letting us know, Coleena. Really glad we were able to help you out. Thanks, Nordia. Glad we could help you with your homework. Really pleased we were able to help you out with your homework. Thanks for letting us know, Archie. Cheers, Josh! I’m really glad you found the information you were looking for. Thanks it helped me with my art homework. Thanks this helped me with my art homework a lot. I also had to copy one of Hundertwassers pics. thank really helped with my art homework!! I used this in my art class it was SUPER HELPFUL!!! wow, this really helped me!! This is very helpful for my homework! This is an amazing website that gave me all the information I need to know on Hundertwasser for my school project. Thank you! for s1 art we had to reasearch on him and this helpd far more than answers.com !!!!!!!!!!!!! help with homework thank you !!!!! Very good but when did he die? Thank you so much,very useful information loved it!!! Glad you liked it, Bethan. Thanks for visiting Primary Facts. Wow! Great help for me and my mates 🙂 Thanks! Brilliant Website! Thanks, Sapphire! Thanks for using Primary Facts. Helped me for my art homework! IT HELPED ME WITH MY PROJECT! This really helped me with my homework. THANKS SO MUCH! It helped me with my art homework a lot!!! thanks! i needed this for my homework and they were very interesting! thanks! this helped me a lot for my homework!! I got an A* on my Hundertwasser assessment all thanks to this site! So thank you very much. Glad we were able to help. Thanks for using Primary Facts. Thanks alot. Needed to do homework for arts and was running late. This site saved me. Thanks! This helped me a lot for my homework! This website is really god .